First effort of Rendell's "Prescription for Pa." is a broad, sophisticated attack on diabetes. 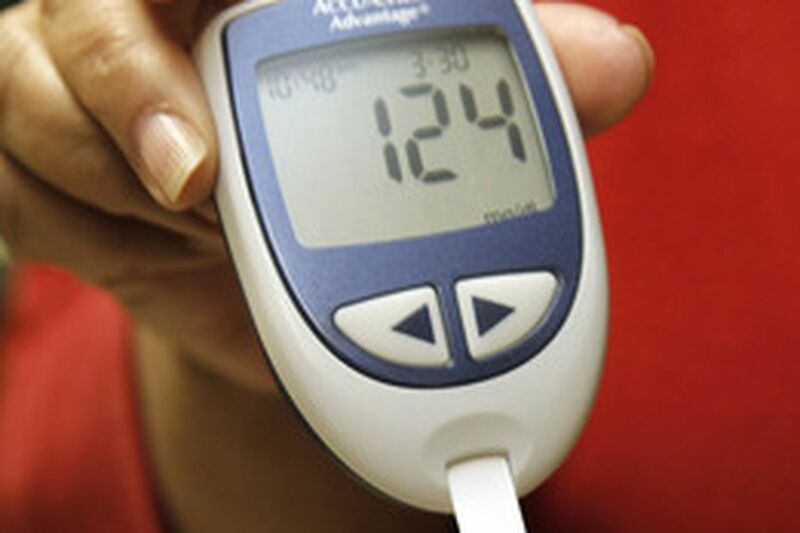 A simple glucose meter is usedto measure diabetics' blood-sugar level to balance medication, exercise and diet. Diabetes dominated Sabrina Banks' summer. When swollen legs made walking difficult, she went to the doctor and was diagnosed with the disease. Then she spent five days in the hospital for related complications. Three weeks later, she was admitted for another five days. After moving back to her native Philadelphia from California in September, however, the 46-year-old home-health aide learned how to better manage her condition. She changed her diet, lost 18 pounds, and hasn't been hospitalized since. Nationwide, hundreds of thousands of diabetics, asthmatics, heart-disease patients, and others are hospitalized each year for preventable complications of their chronic illnesses. For diabetics alone, the financial toll - for preventable amputations, diabetic comas and kidney failure - runs into billions of dollars. Gov. Rendell wants to change that by implementing a model for managing chronic illness across the state. "The beauty of the cost-savings initiatives in 'Prescription for Pennsylvania' is that they will save money and at the same time improve the quality and the caliber of the health care every Pennsylvanian gets," he said. Banks' change of fortune, prompted by a four-week class for diabetics at a city health center, is a relatively simple example of what experts say can be done through improved control of chronic illness. "That is to me what is so tantalizing," Rendell said. He launched his ambitious health plan in January and is working on regulatory and legislative changes to implement it. From 2001 through 2005, nearly 6,600 people in Southeastern Pennsylvania lost toes, feet and sometimes more to amputations that doctors consider a preventable consequence of diabetes, according to an Inquirer analysis of hospital billing records. Over the same five years, complications of diabetes resulted in 35,825 potentially avoidable hospitalizations, billed at $1.7 billion, in Philadelphia and the four surrounding counties. "Complications can be prevented by better care," said Ed Wagner, director of the MacColl Institute for Healthcare Innovation in Seattle and architect of an approach known as the Wagner Chronic Care Model. Among the proven strategies are "equipping patients and families to manage their conditions and creating a medical home for them to ensure their care is coordinated," said Wagner, an internist and epidemiologist. Changing how chronically ill patients are treated can be a daunting challenge, especially in regions such as Philadelphia's, where the use of specialists is among the highest in the nation. The Wagner model focuses instead on primary-care teams led by internists, nurse practitioners or other providers. Rendell plans on tackling diabetes first, an urgent and growing disease among Americans. Nearly 21 million people nationwide have diabetes and 54 million more are in danger of developing it, the American Diabetes Association estimates. Southeastern Pennsylvania's five counties are home to an estimated 287,000 diabetics. More than 96 percent of them reported having a regular health-care provider and seeing a doctor in the previous year, according to the Philadelphia Health Management Corp.'s 2006 household health survey. Still, most experts agree that effectively controlling chronic disease involves more than one doctor can achieve during a typical appointment. "Primary-care physicians are not able to spend the time to address all the issues diabetics face," said Mark Schutta, medical director of the Rodebaugh Diabetes Center at the Hospital of the University of Pennsylvania. "If I have a patient who looks like they are developing a diabetic foot ulcer, I can have them see a podiatrist immediately and prevent that from developing and potentially resulting in an amputation," Schutta said. Currently, however, the vast majority of diabetics are treated by their primary-care doctors, who must address all their health issues during a 15- to 20-minute visit. Moreover, as most family doctors don't use electronic medical records, keeping track of patients' status is difficult. "The current payment system creates incredible pressure to just increase volume of care without providing proper incentives to achieve quality," said Richard Wender, chair of family and community medicine at Thomas Jefferson University Hospital. Rendell's proposal calls for structural shifts in the system, including health insurance. "What we are hoping is that by significantly changing the payment structure, we will encourage a really different way of providing chronic care," said Ann S. Torregrossa, senior policy director in the Governor's Office of Health Care Reform. The state could lead the way because it is one of the biggest purchasers of health care - through Medicaid, state employee health plans, and other programs, she said. Some insurance companies already are prodding doctors to follow medically proven standards for their chronically ill patients. Aetna, for example, increases payments to primary-care physicians who meet certain measures, such as checking diabetics' blood sugar and cholesterol levels at every visit. But the company alerts doctors to problems via e-mail only for its own subscribers. Electronic medical records can track all of a physician's patients this way. Richard Baron, an internist at a four-doctor practice in Mount Airy, invested in the technology nearly three years ago and says he is happy with the results and reminders. But many practices can't afford well more than $100,000 to buy a system and thousands more to maintain it. "We are drowning in a sea of improvement opportunities but the reimbursement system doesn't provide resources for us to do those sorts of things," said Baron, who is secretary-treasurer of the American Board of Internal Medicine. Less costly alternatives include registries - essentially stripped-down databases that enable doctors to enter a range of clinical information, from medications prescribed to blood-test results - for patients with a specific chronic condition. Rendell's 2008 budget proposal contains $2 million to help doctors access and use such registries, which are usually Web-based. "What is beginning to happen in Pennsylvania is very important nationally," Wagner said in a phone interview from his office in Seattle. Leadership by states, he added, creates "an exciting opportunity to reverse what many of us feel has caused the deterioration of American medicine." Asthma, diabetes, congestive heart failure, and other long-term illnesses bring hospitalizations that experts say could be avoided through chronic-disease management. Complications from diabetes alone were responsible for 117,152 hospitalizations in Pennsylvania from 2001 through 2005 due to kidney problems, diabetic comas, and other often-preventable conditions. The economic cost: more than $3 billion statewide. Educate and empower patients to take a central role in managing their health. Give patients a "medical home" - a place where a coordinated team of doctors, nurses and others can help them navigate the health system. Use information technology to promote care that adheres to evidence-based best medical practices. Organize data to make care more efficient - for example, by providing routine reminders as well as alerts of unusual lab results to doctors and patients. Establish regional learning cooperatives to help teach team-based care. Support small provider groups with practice coaches. Develop regional health-information organizations to support data exchanges and patient registries. Work with insurers to restructure reimbursement system in support of chronic-care management practices.